My children are LOVIN' Snack Time lately in our house because they are snacking on Funley's Delicious Super Crackers and they LOVE them! These delicious All Natural Super Crackers come in 4 unique varieties and have superfood veggies hidden inside™ each bite! They have a good source of Vitamin D, Calcium & Iron. And they come in these great flavors: Cheddar n' Stuff (hidden broccoli), Pizza n' Stuff (hidden carrot), Ranch n' Stuff (hidden spinach), Cornbread n' Stuff (hidden sweet potato). Funley’s Delicious, a healthy snack brand for kids and adults, is a huge hit in our house! My children (and I!) love to snack on the Super Crackers and I also love their Wholly Granolly plain or in my Greek Yogurt for a snack! 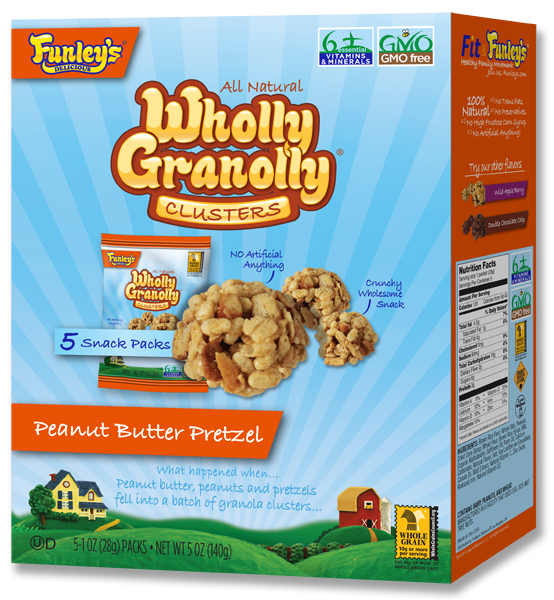 The delicious All Natural Wholly Granolly Clusters turn the granola bar experience on its ear. They made it poppable! They are light, crunchy, whole grain, and have a good source of Vitamin D, Calcium & Iron. They come in 3 unique varieties and low in sodium! The flavors are Wild Apple Berry, Double Chocolate Chip, and Peanut Butter Pretzel. They come in Snack Packs, great for on-the-go. Delish! So if you are looking to try these tasty and healthy Funley's snacks, this is a perfect time because they are starting a Coupon Sweepstakes and offering a $1 off coupon on Funley's Delicious Facebook page. Make sure to use it at your local Target, Sprouts or Ralph's to save money and stock up on some tasty snacks from Funley's Delicious! You can purchase Funley's Delicious snacks at your local retailer or online from Funley's online store.